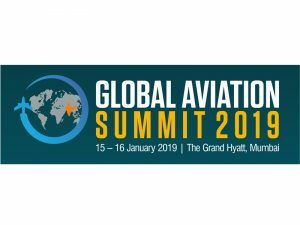 Jayant Sinha, Minister of State for Civil Aviation, Government of India, has launched the official mobile application ‘GAS 2019’, for Global Aviation Summit 2019, to be held on January 15-16, 2019 at Grand Hyatt Mumbai. 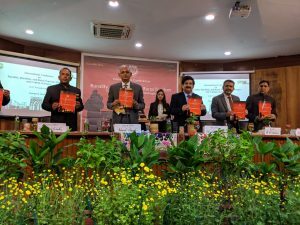 The application was launched in the presence of Rajiv Nayan Choubey, Secretary, Ministry of Civil Aviation (MoCA); Dr Guruprasad Mohapatra, Chairman, Airports Authority of India (AAI); Dr Shefali Juneja, Joint Secretary, MoCA and other officials of the AAI. Available on play store and iOS, GAS 2019 provides a holistic glimpse of the summit and can be used to access latest updates about the mega event. The application enables users to interact with the co-delegates and speakers. It would be an excellent platform for networking through personal and group chats. With the who’s who of the global aviation fraternity set to grace the event, the summit is a promising platform for constructive discussions, collaborations and meeting of minds to explore the future of global aviation. The esteemed guest-list for the summit includes Transport & Civil Aviation ministers from Laos, Thailand, Bangladesh, Nepal and Jamaica, Civil Aviation authorities and Directorate Generals of Civil Aviation (DGCAs) from 22 countries. The future of aviation – drones and seaplanes, airport privatisation, digital travel and holistic development of global aviation ecosystem are the key areas to push the envelope both on regulations and on industry structure. This platform will enable the industry leaders to prepare a policy roadmap that will certainly provide a strong impetus to all players in the aviation ecosystem. The summit will entail B2G, B2B and G2G meetings. Vinod Zutshi, Former Secretary, Ministry of Tourism and Nagesh Singh, Former Additional Secretary, Ministry of Rural Development, Government of India, inaugurated the three-day International Conference on Rurality, Ruralism and Rural Tourism – Challenges and Coping Strategies at Jamia Millia Islamia, Delhi. 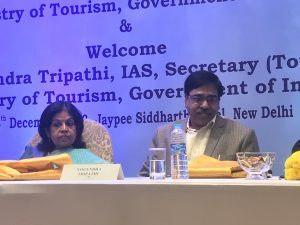 Organised by the Department of Tourism & Hospitality Management, Jamia Millia Islamia, the ongoing conference is being attended by delegates from eminent tourism institutes from India and 25 other countries. “Rural tourism is at a nascent stage but there is a lot of scope and potential to promote rural destinations in India. It is an untapped market and we need to identify more and more destinations across the country,” said Zutshi during the conference sponsored by Ministry of Tourism. MP Bezbaruah, Former Secretary, Ministry of Tourism; S K Misra, Chairman, Indian Trust for Rural Heritage and Development and Ex-Secretary, Ministry of Tourism; Sujit Banerjee, Secretary General ,WTTC India attended the event while Manish Sisodia, Deputy Chief Minister and Minister of Tourism, Government of Delhi is set to preside over the valedictory function. This conference will help bring various stakeholders on a single platform to discuss future tourism trends, ideas, implications and methodologies, theoretical and practical approaches for rural tourism development. The objective is to discuss the contemporary research in the area of rural tourism. The event will showcase rural life, art, culture, and heritage at rural locations and in villages, which have core competence in art and craft. Handloom, textiles, and also an asset base in the natural environment. Providing relief to residents of flood-affected Kerala, Sushma Swaraj, Minister of External Affairs, Government of India, has announced the free of cost renewal of all passports damaged in the Kerala floods. “There are unprecedented floods in Kerala causing huge damage. We have decided that as the situation becomes normal, passports damaged on account of floods shall be replaced free of charge. Please contact the concerned Passport Kendras,” announced Swaraj on Twitter. 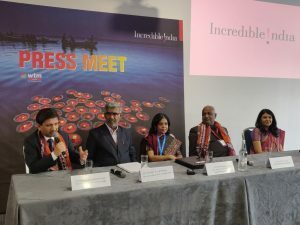 India Convention Promotion Bureau’s (ICPB) MICE international Roadshow in Europe saw participation from more than 100 MiCE buyers and association representatives from Paris, Brussels, Geneva and Zurich. 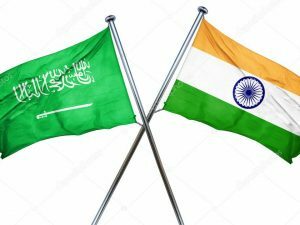 According to a release by ICPB, 12 representatives from India from various segments like incentive operators, venues and professional conference organisers, interacted with buyers and discussed business prospects. 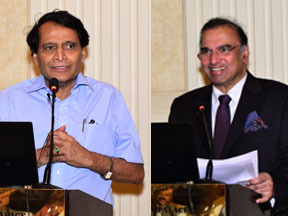 The Indian Ambassadors from France and Switzerland addressed the roadshows and extended support for future events. The roadshows were supported by Ministry of Tourism, Government of India and the Indian Tourism Offices in Frankfurt and Paris. 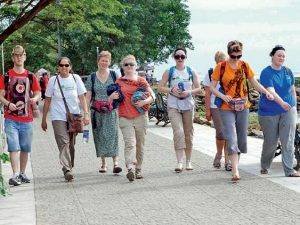 The Government of India has set a target of 20 million foreign tourist arrivals (FTAs) by 2020 and double the foreign exchange earnings as well, according to a latest report by Ministry of Tourism. The number of FTAs in March 2018 were 1.03 million as compared to FTAs of 905,000 in March 2017, showing an year-on-year growth of 13.4 per cent. In CY 2017, foreign tourist arrival in India stood at 10.177 million and reached 3.13 million in January-March 2018. Growth in tourist arrivals has been due to flexible government policies, developed rail and road infrastructure, ease in availability of e-visas to foreign tourists. The Government of India is working to achieve 1 per cent share in world’s international tourist arrivals by 2020 and 2 per cent share by 2025. According to data from Bureau of Immigration, Government of India, Bangladesh, USA and UK were the top three countries in terms of FTAs in India during February 2018. The top 10 source countries accounted for 61 per cent of the total inbound tourist flows in the year 2017. 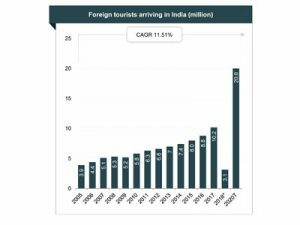 The introduction of e-Visa has led to a strong surge in Foreign Tourist Arrival resulting in a Y-o-Y growth of 62% in February 2018 compared to February 2017. UK, USA and France were the top three source countries availing e-Tourist Visa facilities during February 2018.